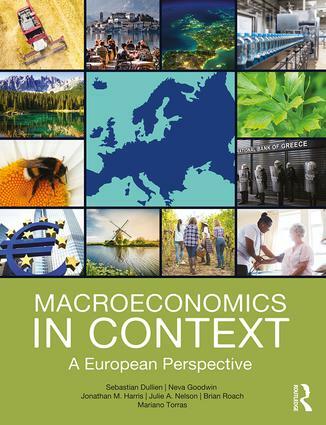 Macroeconomics in Context: A European Perspective lays out the principles of macroeconomics in a manner that is thorough, up to date, and relevant to students. With a clear presentation of economic theory throughout, this latest addition to the bestselling "In Context" set of textbooks is written with a specific focus on European data, institutions, and historical events, offering engaging treatment of high-interest topics, including sustainability, Brexit, the euro crisis, and rising inequality. Policy issues are presented in context (historical, institutional, social, political, and ethical), and always with reference to human well-being. The application of the tools learnt to selected macroeconomic issues, such as the euro crisis, the global financial crisis, public debt, global development, and environmental sustainability. Far more than any other existing macroeconomic textbook, this book combines real-world relevance of the topics covered with a strong focus on European institutions and structures within an approach that explains multiple economic paradigms. This combination helps to raise students’ interest in macroeconomics as well as enhance their understanding of the power and limitation of macroeconomic analysis. Visit www.gdae.org/europeanmacro/ for online resources for both lecturers and students. A video of a panel discussion about the book can be found at https://youtu.be/xjHJrW9WP44.